Sinixt First Nation, indigenous people descendants of Canada, finally won, they obtained recognition. 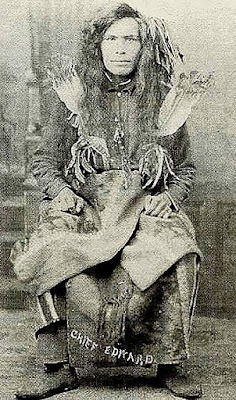 Perhaps “finally” is not a quite accurate word, since the last member of the Canadian Sinixt was Annie Joseph and died in 1950. In fact, from that moment the government declared extinct the native people. but don’t think we will stop. We won’t go back either. Nowadays persevering in our perpetually staring at the horizon it is understandable. Crossing it with sharp eyes and no more labored, no longer afraid, hungry breath too. Here and now you know why we wake up first, and never go to sleep. Present day it is obvious why we enlarge eyes before the normal things. Right now every apparently vain sacrifice compartment becomes meaninful. Every leap of faith is mandatory. And flying without landing rights resonates as a logical, right? The story is explained, the moral is there. It's always been there, where we could not touch it. Where, fortunately, no one could, at the end of the rainbow of colors without a residence permit, but only with your feet firmly on the ground. Up there, on the unreachable road for, protected by clouds of compressed humanity, the podium was waiting. It waited for us, that sooner or later we will be put on the bad guys record. The undesirable people’s house, ever open for creature with complicated names and too lively memory for sedated cultures. The crucial clue, the riddle’s solution was too simple to be put in context. Forgive the mysterious plot’s author, it is called life and is made to surprise everyone, even the longest standing spectators. The curtain is opened again, ladies and gentlemen. Get back in the room, please. Because the show is not at all starting again. You should know that it's never over, if what was true and fair yesterday is still not today. And even when the last light disappeared, the exiled emotion still vibrated behind the scenes made by cement and greyness. The marginalized words resisted under the blanket of double-breasted shoes dust. And the alleged appearances of the farce called modern civilization, only pretended to play the last heartbeat. Clap your hands now, free souls, erased by named only ones. Clap your hands everybody, today. Since now, despite the fragile past has been killed and an inhumane present tried to devour its meat, the future stands up. It looks at us with compassion and smiles.